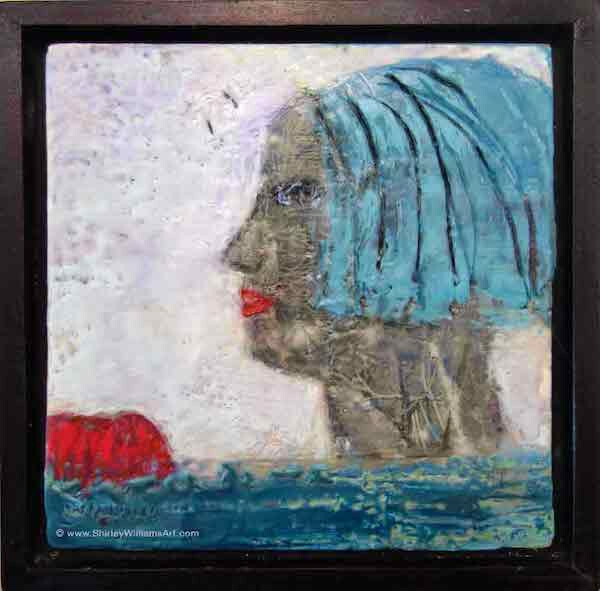 As I mentioned in my last post, this encaustic miniature painting, titled 'Sphinx' measuring only 9 x 9 inches, was one of two small pieces in the recent group show at SB Contemporary in Windsor. My recent series of encaustics are a departure from my usual style of painting with acrylics. I wanted to play a little with imagery in these small pieces by tapping into my subconscious. This one is called 'Sphinx'. One of my passions is ancient history and I'm always fascinated by how advanced some civilizations were, especially the ancient Egyptians. Here I was thinking about the concepts of past and future and the natural human desire for immortality. I don't usually explain the meanings of my art too deeply. Instead I like to hint with a title and then invite people to imagine the meaning for themselves. Yet, naturally it's extra thrilling when someone "gets it". When I arrived at the "Tis the Season" Opening about an hour after the doors opened, the gallery was swarming with people, both artists and art lovers. Someone in the crowd casually assembled some of the artists featured in the show for a group shot. 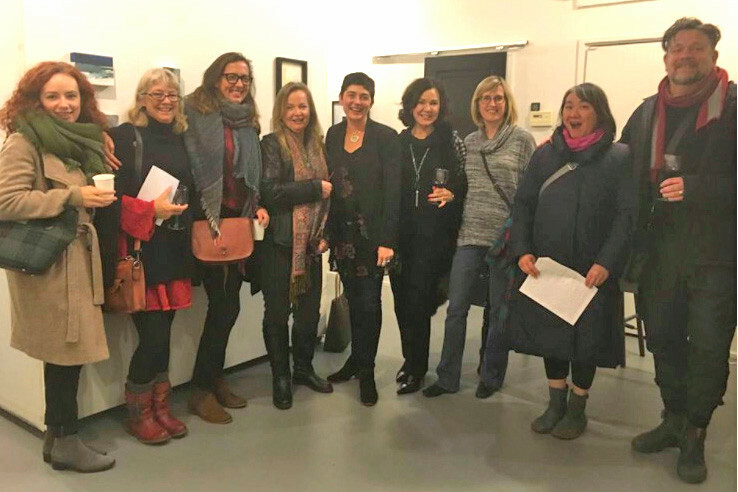 That's me, fourth from the right standing beside the Gallery Director, Sarah Beveridge, who is fifth from the right. To be honest, I didn't expect my little pieces to sell simply because they are so different from what I usually do. To my surprise, Sarah told me that a lady had bought 'Sphinx' and left just before I arrived at the opening. The news left me with mixed emotions. I was truly happy that my little piece had found a loving home. But I was a touch disappointed that I didn't have a chance to meet the lady who bought it. You gotta love social media though. Sarah hadn't mentioned her name. The next day I posted about not knowing who the collector was. She replied within minutes and I was thrilled to connect with her. She was excited about buying it because she too loves ancient history and looks forward to picking it up after the show. Making art is ultimately about connecting with others through the emotional content within the art. When that happens it's a blessing.